Naala-Ba, which in Dharug language (www.dharug.dalang.com.au) is an apt description of the three works presented here for ISEA2013. The works span from the desert country of the Pilbara in Western Australia, depicting fearsome ancestral stories; back across the continent to the metropolitan hub of Brisbane, Queensland’s capital city, and portrayals of the ongoing fight against neo-colonial oppression; then down to the NSW central plains in Riverina country, to gain an insight into some of the matriarchal customs and rituals that refuse to be bowed by the impact of colonisation. Everything in Naala-ba is a contemporary representation of the world’s oldest living culture – our culture – Aboriginal Australia – the First Nations of this land. Merindah Donnelly, Indigenous Creative Producer, ISEA2013. Yunkurra Billy Atkins, Martu, was born in the 1930s and lives in Jigalong Community, Western Australia. Sohan Ariel Hayes was born in the 1970s and lives and works in Perth, Western Australia. Cannibal Story brings to life ancient carnivorous beings that live beneath Kumpupirntily (Lake Disappointment), a salt lake at the heart of Martu country, in the Western Desert, Western Australia. Yunkurra Billy Atkins is the great animator of the dark narratives that score this area where Martu fear to tread, and his beguiling paintings have intrigued and challenged art lovers for many years. Now new audiences are invited into the world of his art, his imagination and his country, as Yunkurra’s paintings are brought to life through his collaboration with award-winning animator Sohan Ariel Hayes. Cannibal Story gives sound and emotion (and a touch of violence) to the beauty and danger of Yunkurra’s original paintings. Yunkurra Billy Atkins, a Martu artist, lawman and storyteller, was born at Well 9 on the Canning Stock Route and grew up in the country around Wiluna, but returned north to his ancestral homelands, which includes Lake Disappointment, Savory Creek and Jilakurru. He is a knowledgeable senior Martu man and an authority on these important Martu places. Having narrowly avoided being taken away by missionaries as a child, he grew up with Elders, learning about country proppa way. Yunkurra, now living at Jigalong, close to his home country, has been painting and carving as an independent artist since the early 2000s. His work has been included in numerous group exhibitions in Australia and overseas. Solo exhibitions include one at the Courthouse Arts Centre and Gallery in Port Hedland in 2004, and Pretty One at William Mora Galleries Melbourne in 2010. His work was selected for the 2003 Telstra National Aboriginal and Torres Strait Islander Art Award. Yunkurra’s works are included in the collections of The National Gallery of Australia, The National Museum of Australia and the National Gallery of Victoria. Sohan Ariel Hayes is a Perth-based media artist working in the fields of expanded and interactive cinema, animation, pervasive games, systems theory, locative media. Hayes has exhibited widely, including at the Museum of Contemporary Art in Sydney, Fremantle Arts Centre, the Perth Institute of Contemporary Arts and Goddard de Fiddes Gallery in Perth, Plimsoll Gallery in Tasmania, the Jerwood Gallery in London, TAV Gallery in Taiwan, and the Post Museum in Singapore. He has received several national and international awards for his work, including from the British Multimedia Industry Awards in 2002, Laval Virtual, France (2011), Atom Awards, Australia (2002), and the Freeplay Independent Game Awards, Australia (2010). In 1997 he received a nomination for ABAF Most Outstanding Patron of the Arts, Western Australia. Cannibal Story is a co-production of Fremantle Arts Centre, City of Fremantle and Martumili Artists, Shire of East Pilbara, supported by Martu People Limited and BHP Billiton. Carriageworks is a cultural facility of the NSW Government and is supported by Arts NSW. Gordon Hookey, Waanyi, b. 1961, lives and works in Brisbane. This work is Gordon Hookey’s response to the occupation of Australia by the establishment of Terra Nullius, and its subsequent legacy for generations of disempowered and uprooted Indigenous people. 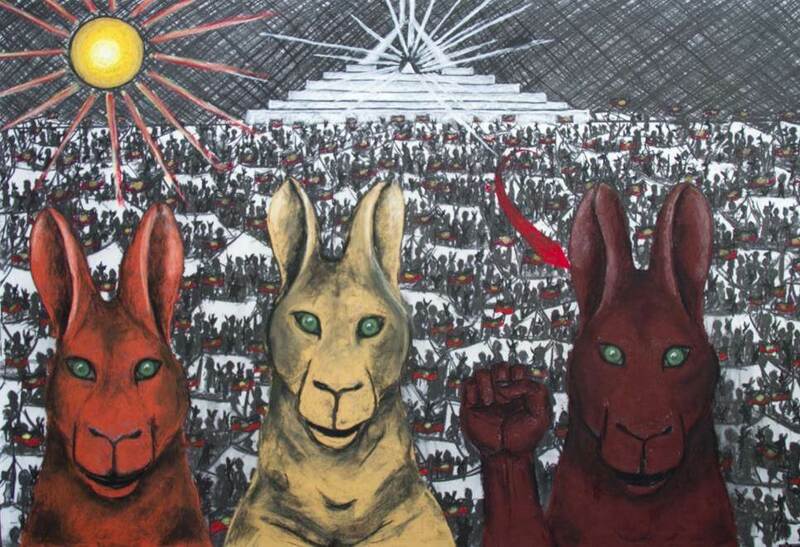 He uses the iconic Australian marsupial, the kangaroo, as his motif of resistance; ironically the same animal that is used to adorn the Australian flagship carrier Qantas. Hookey coined the term ‘Terraism’, taken from ‘Terra Nullius’, to push an Aboriginal agenda in the debate in regards to the continual fight for land. Terraism is an attempt to disarm the hypocrisy of the governmental finger pointers, whilst emphasising that Aboriginal rights are the last thing to be considered when it comes to the investments, decisions, and excuses made over land by the Australia government. Gordon Hookey belongs to the Waanyi people. His work combines figurative characters, iconic symbols, bold comic­like text, and a spectrum of vibrant colours. Through this idiosyncratic visual language he has developed a unique and immediately recognisable style. Hookey locates his art at the interface where Aboriginal and non­Aboriginal cultures converge. He explicitly attacks the establishment and implicates our current political representatives. Hookey’s visual aesthetic is breaking new ground with a foray into stop­motion animation, as evident in Terraist. Digital HD moving image, duration 03:50 mins, looped, col, sd, 2010. Courtesy of the Artist. This ‘lo-fi’ film merges past and present while anchoring ideas of spiritual practice in a historical context. Using movement to access altered states of awareness is a common practice worldwide. In ritual the movement often accelerates, and sound becomes louder, layered and intense, as energy is raised. In this work, in contrast, the image is slowed down and the sound bed minimal, in order to allow the viewer access to ‘the space that is experienced in between’. Shifter reflects aspects of self co-existing, each informing and experiencing the other – shifting and morphing, yet holding the same space, represented by the circle. The work highlights a capacity, and often a need to shapeshift in the world. In its broadest sense, shapeshifting is when a being has the ability to alter its physical appearance; cultivated, this becomes a skill and an asset, and allows for multifaceted expressions of authenticity. Naretha Williams is an interdisciplinary artist whose bloodlines are Wiradjuri (NSW), English, Irish and Chinese. She creates work that explores, questions, provokes and dismantles ideas around identity, culture, esoteric knowledge and contemporary shamanics. Consistently challenging assumptions on authenticity, her work often takes place in grey areas, and lines are deliberately blurred. As an interdisciplinary artist her process is fundamental to the work itself, and she is continually excited about the alchemy of art. She is an experienced performer, production technician and artistic creator, and has toured nationally and internationally with both Indigenous and non-indigenous productions. Presented with assistance from Arts NSW.